It’s Friday at 10am in a remote field in Fife. John Burnside is taking his morning walk, whilst simultaneously attempting to conduct a conversation with me down a dodgy telephone line. Within seconds he’s speaking about a concept of happiness — or lack of it — that goes back to philosophers such as Nietzsche and Schopenhauer. “I’m in the middle of a remote country hill in Scotland, so the reception is not really that good, especially in bad weather like this,” he tells me, his voice fading in and out. As he begins to walk over to his house — and the reception gets slightly better — I’m beginning to picture an idyllic, lush, landscape: where Burnside walks for hours, every morning, making mental notes, perhaps gleaning inspiration for another prize-winning collection of poetry, or piece of prose fiction. Closing the door over into what sounds like his kitchen, we’re starting to enter into the realm, finally, of what one might perceivably call a normal interview environment. 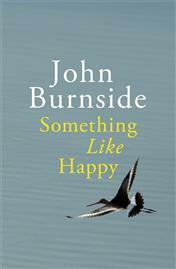 Burnside begins by answering some questions about his latest collection of short stories, ‘Something Like Happy’. Is attaining the state of happiness a subject you thought about when you were writing this collection? Yeah. I’ve been reading a lot of philosophical stuff about happiness over the last few years. The idea that we always see on advertisements: that you can somehow buy something that would make you happy, it’s such an infantile idea. There is also a political dimension to this false happiness that we are caught up in, or are being offered. Would it be correct to say many of your protagonists are people who have lost something that made them happy? Well a lot of the characters in this book are people who have been deceived, in various ways, into thinking about what happiness might be for them. It’s an idea that goes back in German philosophy historically: which basically says that happiness being a state, is a false perception. One of the problems of creating this illusion of happiness is that when the chance of it arises, we are not prepared for it, because we’re thinking about something else. So what do you think happiness is? It’s something that could have come to you if you weren’t so preoccupied with the very idea of happiness: which in itself is basically an illusion. But I do think, however, that contentment — or whatever the right term is — can just come from simple things and appreciating them: having a good cup of coffee, for example, can make you just as happy as going to some fancy nightclub for the night. Were you trying to comment in these stories about provincial life, and power structures within those communities? Well one of the things that happens in smaller communities is that there are a small proportion of people who have power. In a city — at least for a while — you may be at the bottom of the social ladder, but you can imagine the sheer possibility that is out there, because you don’t see the power structures as clearly. In small towns you see those power structures very clearly: you are born into them, and, unless you move away, it’s very hard to get out of them. There seems to be a certain kind of short story that you are trying to write here — would philosophical be the right word in describing it? Well I certainly wanted to include people having philosophical conversations inside their heads. I’m a little tired of the very simple, Carveresque, paired-down-story. I’m much more interested in a story that is both lyrical, and philosophical, which gives characters room to do more than just make a cup of tea. But also gives them a chance to think about where they went wrong. The majority of your characters in this book are female: do you find it hard to write from the perspective of a woman? When I’m writing a female character I simply feel I’m writing about an individual, I don’t think: I am writing about the condition of being a female. It’s the same when I am writing a male character: they are usually based on observations of various different people. Also, I grew up in a female household where my father was largely absent. Most of the time it was my two sisters and my mother there. I guess I find the experience of women more poignant and more interesting in working-class life especially. In the past I was quite concerned with writing about the problems of male working-class life: the violence, and the sense of powerlessness. But growing up and watching the women around me, their lives seemed more nuanced. They weren’t blinded by an illusion that you could prove yourself by being violent or whatever. You’ve lived in both Scotland and England: do you see much of a distinction — culturally — between the two countries? Perhaps more is made of the Scottish/English divide than is necessary. Obviously with the current situation of the nationalist agenda in Scotland we are stressing that more than we would normally otherwise do. There is no doubt that there are definitely distinctions between Scottish and English writers, but there is a danger of making too much of it. I’m far more inclined to think that working-class people throughout Britain have more in common, than say an ordinary Scottish person, and a member of the landowning class in Scotland would, for example. So you see the distinctions in terms of class — throughout Britain — rather than a big difference in culture? In a very sort of old Left way, I find the whole Scottish nationalist issue an irritation. We are all expected to vote on whether we are going to be independent or not, and the undercurrent of that is an idea that we will somehow be free. Right now a vote for the referendum on the Scottish independence issue would be taken as an endorsement of Scottish nationalism, and that is not the issue. We should be working together, rather than concentrating on this national borderline question. That just takes away from the real questions: such as poverty, equality, and social justice. When you are writing poems, do you tend to incorporate different voices into them? I have written a number of narratives poems, most recently, for example, I wrote a poem about my sister disappearing when I was a child, she was three-years-old. Usually the starting point will be something that happened, as it were, in real life, but from that point on, you just let your imagination do the work. Unless you are writing something that you are calling autobiographical, or documentary, you take the story where it wants to go. The starting point simply opens a door into a possibility of that experience. Things that happened, or could have happened in different ways: poetry is a way of exploring those other possibilities. Is keeping the language both sensual and tactile in your poems about trying to allow the reader to feel what you have experienced? Well I have always disliked poetry that is more concerned with form than actual experience. I want the language I use in a poem to be adequate in describing the experience as it happens. I feel adrift from the poem that is made in the library and not in the field. If poetry does not reflect experience of the world then it doesn’t interest me as much. Your poems also seem to be concerned with new beginnings as well? Yes, that is a theme that I have looked at many times, by asking: how we are born into a world that is already defined for us by our parents, teachers and authority figures. We are expected to appreciate that world, or approve or disapprove of it, in very subtle ways that are imposed upon us. So for example in the poem ‘History’ from the collection, The Light Trap I’m asking: can we unlearn that, and come to the world afresh? Can we unlearn all those values that are imposed upon us, to try and figure out if the things that we are taught are actually reasonable and logical? Or are they just based on the ideas of the privileged in society? The relationship you had with your father has been well-documented in both your memoir A Lie About my Father, and some of your more confessional poems. Did writing about him help you make sense of the trauma he brought to your own life? You try to make sense of it beforehand, and then it seems to be interesting enough to start exploring it as a piece of writing. I wouldn’t have been able to write the memoir you mention if I didn’t work through the material before I started writing. I sat down to write the book because I discovered the central secret of the book: which was that that my father was a foundling, he was found on the doorstep. Then he was passed from family to family. So this was the final fitting into place of the jigsaw in my head. Before that I had just been angry and hated him because of how he had behaved, but when I began to understand more of the details, I began to imagine what his internal life might have been like.